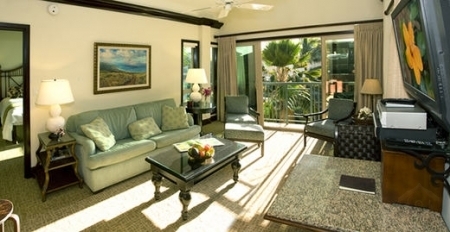 A two-master-bedroom suite condo in an oceanfront Luxury Kauai Resort that won the prestigious Parade of Homes Award of Excellence in 2006 and was rated 1 in Hawaii by the Expedia Insiders club. 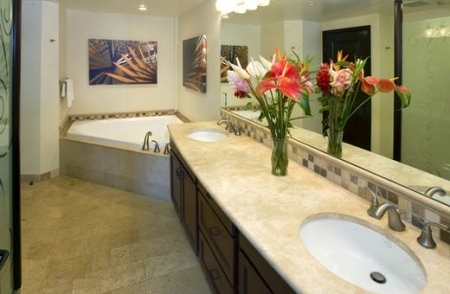 With the upscale design and fine materials of a luxury hotel, this unique combination of hotel-type amenities and the comforts of vacation home will enable you to experience a luxurious yet affordable vacation on the Garden Island of Kauai. 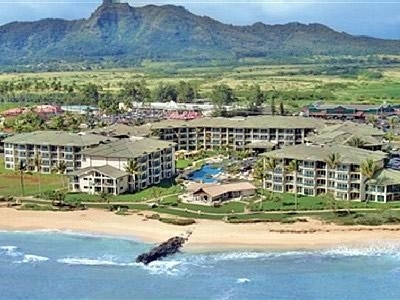 The Resort is located on the Eastside, an ideal central location for your Kauai vacation. You might start your day with a golden sunrise, a cup of Hawaii- grown coffee and a candy-sweet papaya from the local farmers market or perhaps with a barefoot walk on the golden sands of Waipouli Beach. Surround yourself in the warm trade winds as you watch the shimmering waters of the Pacific and your children frolic in the 2-acre lazy-river pool. 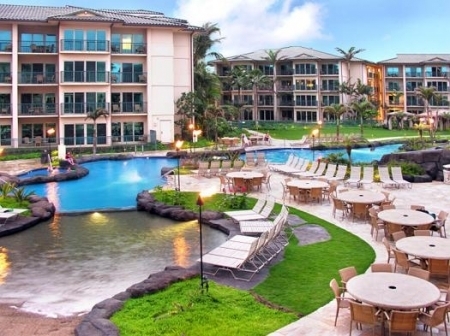 The pool winds through a lush tropical landscape complete with waterfalls, two water slides, a sand-bottom pool for young children, a "secret" grotto, and three whirlpool spas. Enjoy a refreshing drink and a snack at the Oasis bar and gourmet restaurant. Treat yourself to a relaxing spa treatment at the on-site full-service Spa By The Sea. Dine on the lanai as the sun sets with its nightly display of color. Lounge in the living room as you enjoy a full spectrum of entertainment with the large flat screen television, DVD, Stereo & CD player. Relax with a movie that was made on Kauai and try to identify where the scenes were filmed. Retreat to one of the tropical theme Master Bedroom Suites to enjoy a book from the condo library and the soothing sounds of the waves. Prepare a picnic lunch or a gourmet meal in a kitchen fit for a chef. Your condo is a place you will enjoy, remember, and look forward to visiting again. Activities abound on Kauai. Kayaking, boogie boarding, surfing, snorkeling, scuba diving, body boarding, kite surfing, the list goes on. Your vacation rental condo is equipped with snorkel gear for two adults and 2 children, boogie boards, and beach gear. Hiking, mountain biking and horseback riding are just a few of the possible day's diversions. For the more adventurous, there's also hang gliding, deep-sea fishing, water-skiing and helicopter rides. All activities come with free-of-charge, breath-stealing, natural beauty. Also, while you can't use this as an excuse every time you want to come, Kauai is a popular place to get married as well as to honeymoon. Everything you need is within strolling distance. 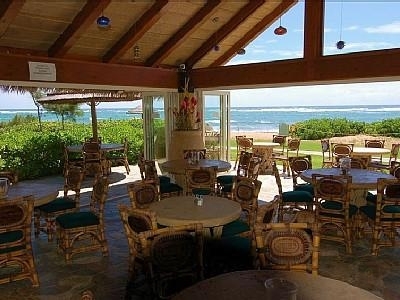 Coconut Marketplace, just down the road from Waipouli Beach Resort, features shops, restaurants, and live music. 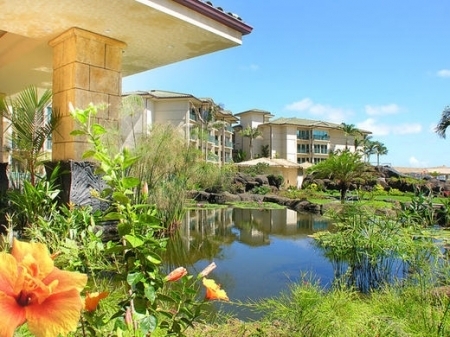 Kauai Village, across the road, has fine dining spots, hole-in-the-wall eateries, jewelry stores, art galleries, healing and wellness centers, grocery stores, and a pharmacy. You'll spot everything from fresh leis to fresh vegetables, aloha shirts to hibiscus soaps, and hand-carved koa bowls to handmade quilts. 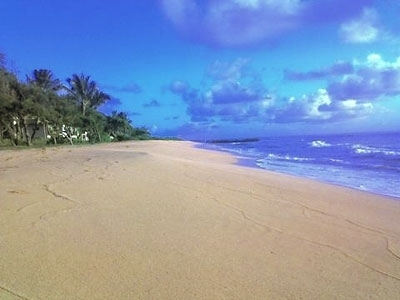 Or--You might kick back and let your stress melt away in the warm sun and gentle trade winds of Kauai. Visitors sometimes have difficulty realizing they don't have to leave the vacation rental resort! Catamaran cruises, world-class golf courses, surfing, snorkeling, hiking, hula shows, luaus, and sight-seeing can easily use up your day. With weather that is moderate year around, it's OK to lie for hours on the beach or by the pool, or sit on one of your lanais and watch the surf. The people of Kauai offer a welcoming spirit of aloha that makes you feel right at home. You will fall in love with the beauty of Kauai and its people. A non-refundable deposit of 25% of the total rental cost is required to guarantee a booking. Reservations must be guaranteed with a credit card or other means through PayPal. The balance is due not later than 60 days prior to check-in. A $150 after-departure cleaning fee is required. A refundable $500 Security deposit is required upfront. The full $500 will be refunded if there is no damage to the condo or it's furnishings. (Tax is not applied to the Security deposit.) The Primary renting guest must be at least 24 years old. Parents who are not guests may not book properties for their children. Maximum occupancy is 6 adults, with children over the age of 12 counted. Overcrowding or misrepresentation is grounds for immediate removal without refund. Daily housekeeping is not included. Housekeeping service is available for an additional $65 per day. The condo complex is a non-smoking facility. You get 1200 sq. ft. of deluxe new condo, including a gourmet kitchen, for less than the price of a 300 sq. ft. hotel room. And you'll save hundreds of dollars by making a few meals or packing lunches for outings. Extended Night Specials: Take 5% off any 10-night stay! Check-in time is 4PM. Check-out time is 11AM. Clean linens and bath and pool towels are supplied with the condo, but. Kauai is known as the "Garden Island" due to its lush green landscape. Even among the Hawaiian Islands, Kauai stands out for the natural beauty of its sculptured cliffs, cascading waterfalls, quiet lagoons and pristine beaches. The rivers and streams nourish a phenomenal abundance of trees, flowering plants and exotic birds, many species of which cannot be found anywhere else. Much of the island is untouched by human development, and you can explore it by foot, boat, plane or helicopter. The Waimea Canyon, �the grand canyon of the pacific�, the rocky NaPali Coast, and the beautiful Hanalei Valley offer breathtaking vistas. Or, you can simply drive through whispering palm groves, rolling hills and quaint villages. Perhaps you'll take advantage of some of the world's finest beaches, golf courses and restaurants. Or you might go hiking, surfing, snorkeling, hiking, bicycling, kayaking, ziplining, horseback riding, or just driving among Kauai's unrivaled natural splendors. Possibilities for exploring the outdoor treasures on Kauai are unlimited. We keep a list of things we want to do and it keeps getting longer even though we try to do some of them whenever we can. Perhaps it's the natural beauty of Kauai that brings out the best in people or maybe it's the island tradition of gracious hospitality. Whatever the reason, you'll find that the people of Kauai offer a welcoming spirit of aloha that makes you feel right at home. 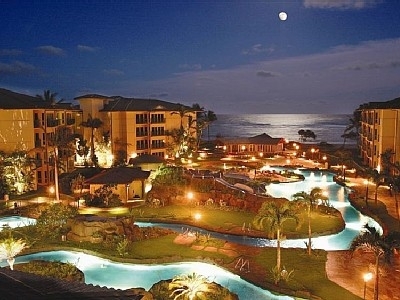 We have fallen in love with the beauty of Kauai and Hawaii�s people. they are available for your enjoyment.